A single PACT nail fungus treatment session will involve one of our Podiatrists debriding and removing all of the infected part of the nail, a special PACT nail fungus gel is then applied to the nail and left to absorb for 10 minutes. This gel stains the fungal cells making them sensitive to the light emitted by the scientifically tested PACT LED lamp. 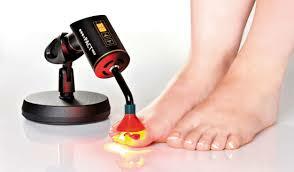 The PACT LED light is applied for 9.5 minutes penetrating the nail and destroying the fungal cells. Please make an initial appointment with our Podiatrist. They will assess and diagnose your toenails and see if your nails are suitable for nail fungus therapy. If your nails are suitable they will explain the treatment process in detail, structure your treatment plan and schedule your nail treatments.